For the latest version of ofgpu for OpenFOAM visit "GPU v1.1 Linear Solver Library for OpenFOAM". ofgpu v1.0 is the latest version of our free GPL library that provides GPU (sometimes referred to as GPGPU) linear solvers for OpenFOAM® v2.1.x. The library targets NVIDIA CUDA devices on Windows, Linux, and (untested) Mac OS X. GPU acceleration holds the promise of providing significant speed up at relatively low cost and with low power consumption compared to other alternatives. If you want to try our ofgpu library with OpenFOAM then we recommend that you use either a dedicated (i.e., not displaying graphics) high-performance NVIDIA graphics card or a TESLA card. Download our free GPL licensed ofgpu library [last update Jan. 21, 2013 to v1.0]. Patch your OpenFOAM source with our CUDA modifications. Note that this is the same source code patch that adds Windows support for OpenFOAM 2.1.x. Submitted by LIQNEU (not verified) on February 13, 2013 - 11:10. 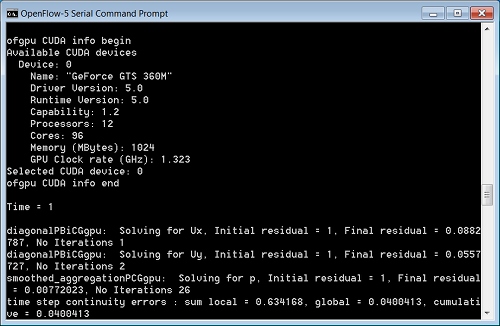 I have tested the "double precision" and "single-precision" OpenFOAM with OFGPU-v1.0 under windows 7 platform. For an example of a GPU-enabled and -diable case of pitzDailyGpu under the same computer with non-parallel cpu conditions. And clock time is 188s and 67s, respectively. I wonder why case with GPU-enable is far slow than the one of GPU-disable. Any suggestions? Submitted by LIQNEU (not verified) on February 13, 2013 - 22:51. I have further tested the different cases considering grid number using OF-2.1.x and ofgpu-v.1 at double precision mode. grid number 12225 GPU-disable 67s; GPU-enable 188s for timestep number 753. Advantage of GPU-enbale solver can be achieved through increasing grid number. Submitted by LiQNEU (not verified) on February 20, 2013 - 04:33.
when grid number is 1024000, compressibleInterFoam's GPU is 610.805s and CPU with GPU-disable is 579.499s, why? Submitted by JACK (not verified) on March 11, 2013 - 08:51. I have build the system of ofgpu, but I can't find the file of <ofgpu-root>/install, or what's mean of <ofgpu-root>/install. I can't continue the next steps because of the problem. any suggestions? please help me. Submitted by symscape on March 11, 2013 - 09:40. For CMake configuration help see the comment from a previous ofgpu release at "Versions and CMake". Submitted by JACK (not verified) on March 18, 2013 - 20:18. Thank you for you attention. I have solve the problems with your help. But at the fourth step: Patch your OpenFOAM source with our CUDA modifications. I am very confused. Can you provide me some details procedures or some tips about how to Install MinGW-w64 cross-compiler and zlib on Linux because I'm a new programmer. configure: error: Please check if the mingw-w64 header set and the build/host option are set properly. Submitted by symscape on March 18, 2013 - 20:22. I suggest you pick up a pre-compiled MinGW-w64 compiler rather than compile your own. Submitted by Auggie (not verified) on March 22, 2013 - 07:52. Now I have finished the third step,but I am confused in the fourth step in the build procedure. The MinGW-w64 is a cross-compiler, but I am only in the linux not windows. I was wondering if it is necessary to install the MinGW and are there some adjustment for installing steps in linux? Submitted by symscape on March 22, 2013 - 10:17. If you only need a Linux build then you don't need to install the MinGW-w64 compiler, but you still have to patch OpenFOAM. Submitted by Auggie (not verified) on March 23, 2013 - 22:00. I skip all the procedures about MinGW-w64 because I only need a Linux build. So in the fourth step: Patch your OpenFOAM source with our CUDA modifications, I adjusted and simplied the steps. For example, I skip the first four steps in the patch build process and go the the fifth step immediately (Install the OpenFOAM 2.1.x source distribution on Linux). I am going to skip all the adjustments about MinGW-w64 such as the environment variables, I was wondering if it is right and workable. Is there any suggestion? Thank you . Submitted by Auggie (not verified) on March 23, 2013 - 23:27. I do what I said above. I was wondering what I should do next. Thank you very much. Submitted by Auggie (not verified) on March 25, 2013 - 08:53. I have tried it again and again. Now I have patched the v8-mingw-openfoam-2-1-x.patch successfully. I skip the 7th step about seting OpenFOAM MinGW-w64 environment variables and source etc/bashrc because I don't install the MinGW and the 8th step about Installing the ThirdParty-2.1.0 source. Then I go to build OpenFOAM. When I run ./Allwmake in the $(WM_PROJECT_DIR). The errors appears. Do you have any idea what could be the problem? Thank you. Submitted by Anonymous (not verified) on August 22, 2013 - 14:55. 25 errors detected in the compilation of "/tmp/tmpxft_0001d17e_00000000-6_sparsematrixsystem.cpp1.ii". Submitted by Roberto Ribeiro (not verified) on September 9, 2013 - 10:22. How did you managed to get it run in double precision mode? what changes did you made? Submitted by diablo80 (not verified) on September 19, 2013 - 07:16.
does your lib also work in parallel, if I use more than one CPU? I'm getting strange continuity errors by calculating your test case using more than one CPU. Submitted by symscape on September 19, 2013 - 07:19. If by parallel you mean in combination with MPI, then no ofgpu does not support MPI. Submitted by diablo80 (not verified) on September 19, 2013 - 07:22.
yes I meant in combination with MPI. Submitted by symscape on September 19, 2013 - 07:28. No, ofgpu does not support multiple GPU cards. Submitted by ROberto RIbeiro (not verified) on September 19, 2013 - 09:46.
can i have some quick and brief information in what the methods SparseMatrixSystem::initialize(SparseMatrixArgs const & args) and SparseMatrixSystem::assignMatrix(SparseMatrixArgs const & args) do? Like in which memory system they operate host or device? Submitted by Elia (not verified) on September 20, 2013 - 11:40. Hi, I've got some problems regarding OpenFOAM compiling. Then I have to compile OpenFOAM. It begins to compile and after few seconds of beautiful outputs an "error cascade" occurs on my terminal. It seeks mpi.h but I thought this patched version of OpenFOAM-gpu should skip mpi compiling. Submitted by symscape on September 20, 2013 - 11:57. Submitted by S. Paul (not verified) on October 10, 2013 - 02:26. I have 2 gpu cards on my system. ofgpu detects both but always select device-0 for executation. Is is possible to dynamically select any one of the device during runtime? Submitted by symscape on October 10, 2013 - 09:04. See the original description above for the syntax. Recognized devices and device numbers are listed in the std output during startup, as shown in the screenshot.